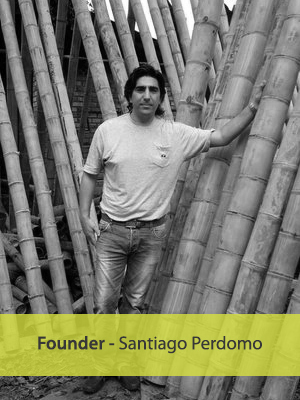 The Best Bamboo™ is the latest start up of successful entrepreneur Santiago Perdomo. The company was founded in 2006 after he discovered the large demand for bamboo products throughout the world. As the co-founder and owner of Bamboo Trader S.A.S. in Colombia, he gathered a wealth of experience in regards to growing and exporting Guadua bamboo from South America. Santiago explains: "We kept receiving daily inquiries for smaller order in the USA. The problem was that we couldn't export less than full container loads from our production facilities in Colombia. Bamboo poles are bulky and take up quite some volume, therefore shipping costs for retail orders would have been to costly." The Best Bamboo aims to store and export large inventories of high quality bamboo products, going from poles, crushed mats and slats, to laminate beams, floors and panels. With a large stock available through all our distributors in North America and Europe we will be able to fulfill direct orders to local architects, builders, bamboo craftsman or hobbyists. The Best Bamboo takes much pride in the fact that all bamboo is grown, harvested and processed in the Americas, and this in a socially and environmentally sustainable and responsible manner. Design and construction of ecological trails.